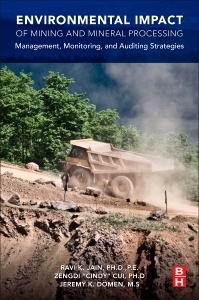 Environmental Impact of Mining and Mineral Processing: Management, Monitoring, and Auditing Strategies covers all the aspects related to mining and the environment, including environmental assessment at the early planning stages, environmental management during mine operation, and the identification of major impacts. Technologies for the treatment of mining, mineral processing, and metallurgical wastes are also covered, along with environmental management of mining wastes, including disposal options and the treatment of mining effluents. Ravi Jain is Dean and Professor of the School of Engineering and Computer Science, University of the Pacific, Stockton, California. He received his B.S. and M.S. degrees in Civil Engineering from California State University, and a Ph.D. in Civil Engineering from Texas Tech. He studied public administration and public policy at Harvard, earning an M.P.A. degree and did additional graduate studies at Massachusetts Institute of Technology (MIT).